WHO WILL MAKE AN IMPACT ALL OVER THE WORLD? 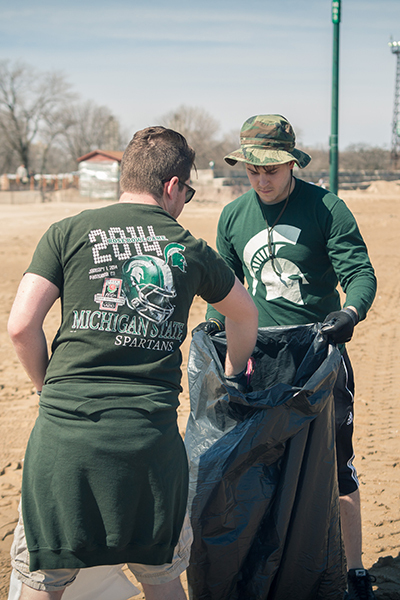 When you’re a Spartan, you’re part of something far bigger than campus’ 5,200 acres. We’re a global community more than 550,000 strong, and we’re passionate about making the world a better place. Spartans have a proud tradition of service - many MSU alumni are inspired to serve in their personal and professional lives. This extends to our alumni clubs, employers, individuals, and MSU, who are actively involved in their communities. Additionally, thousands of students give back each year through campus’ Center for Service-Learning and Civic Engagement. Every year in April, as part of the SPARTANS WILL. SERVE initiative, there is a Global Day of Service to harness the power of this spirit of service, and demonstrate what Spartans can do in a single day. Not available on the MSU Global Day of Service? You can participate in a number of service projects year-round, or you can make an impact by supporting the university financially. Since 2013, SPARTANS WILL. SERVE has been a great success. Nearly 45,000 hours of service have been donated by more than 9,000 volunteers in 725 locations. These volunteers have provided a collective impact valued at $1,007,282 to their causes. Volunteers, thank you for your commitment to strengthening our communities. All service projects are registered on the SERVE.MSU.EDU website. When you’re ready to register your project, be sure to check out our Tips for Registering a Service Project. We encourage all who create a project to review the Project Planning Guide, which is intended to assist in the creation, registration, promotion, execution, and follow-up for a service project. All service projects are registered on the SERVE.MSU.EDU website, so you’ll find an opportunity to volunteer there. We do request that all volunteers register for the service project they’re interested in to ensure an accurate headcount, and that they receive communications regarding the project. After you register to volunteer, you’ll receive an email that confirms the details of the service project and the name and contact information of the project coordinator. You can also expect to receive an email from the project coordinator two to five days in advance of the event. What if There is No Project to Volunteer for in My Area? If you do not see a service project listed near you, we encourage to first contact your local alumni club. Chances are they’re planning something, but it may not be registered on the SERVE.MSU.EDU website yet. You may also choose to connect with a community partner/organization and register as an individual participant/service project. Keep checking the SERVE.MSU.EDU website, as new projects are added frequently. For More Information: If you have questions about the Global Day of Service, please see our frequently asked questions. Should you have additional questions, please contact MSU Alumni Association Programs Director, Maria Giggy, via email or by calling (517) 355-7724.